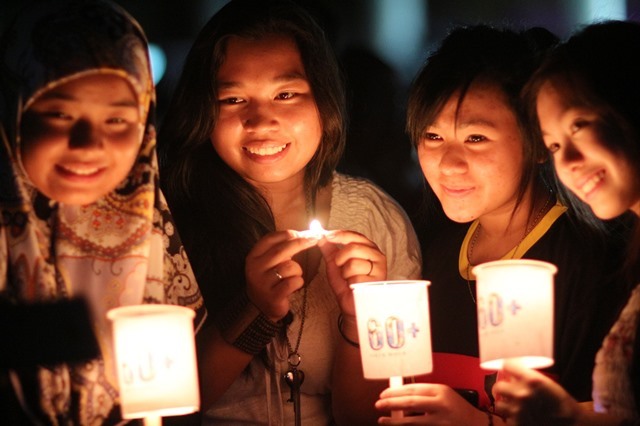 Earth Hour is a global initiative for uniting to spread awareness towards protecting the Planet. Earth Hour calls in individuals, businesses, government, community, young, old and the vibrant youth to turn out their lights for one specific hour. Hundreds of millions of people, businesses and governments around the world have united each year to support this historical event of global environmental importance. On 31st March, 2012, the spirit of Earth Hour is back and all concerned citizens across the globe are called forward to unite to spread awareness on the ongoing environmental crisis and for ensuring sustainable development. Along with you, at 8.30 pm local time on Saturday 31 March, Earth Hour 2012 will see hundreds of millions of people around the world cross borders of race, religion, culture, geography and society to unite in a single moment of contemplation for the planet and celebration of their year-round commitment to protect the planet. Now in its sixth year, the annual lights out event has grown from a single-city initiative in 2007 to become the world’s largest display of environmental action, with citizens of 135 countries and territories across every continent coming together for Earth Hour 2011 indicating a growing global movement of positive change in environmental attitudes. Last year, the support was in lengths and breadths with 1.8 billion individuals, in 5200 cities and 135 countries switching off for an hour. WHERE: Across the globe, and at your home/office. WHY: To celebrate your commitment to the planet with the people of the world. HOW: Switch off your lights and register your support. The intensity of the event’s support is seen by the ‘putting off’ of lights by world’s most recognized landmarks like the Eiffel Tower, Forbidden City, Buckingham Palace, Golden Gate Brigade, Table Mountain, Christ the Redeemer Statue and Sydney Opera House. Last year, the event in Delhi was flagged off by Delhi Chief Minister Smt. Sheila Dixit, Earth Hour Ambassador Vidya Balan and Mr. Jim Leape Director General, WWF International. This year, the promotion of the event has been in full swing with 2012 campaign ‘I will if you will’ on networking sites like Facebook, Twitter and Google Plus thus playing a crucial role in bringing support for action. The event is being supported by popular personalities like Dhanush and ambassador Sachin Tendulkar. Also, an interesting fact that needs to be shared is that the six mega cities of Delhi, Mumbai, Kolkata, Chennai, Hyderabad and Bangalore are competing with each other this year to become the ‘Earth Hour Champion’. The city which has the maximum participation from its citizens, organisations, institutions and government will be declared the winner! This Earth Hour take action for your city by switching off lights on Saturday, 31st March from 8:30 to 9:30 PM and make your city an Earth Hour Champion. Your opportunity to ‘be part of Change’, Up for IT?